Nutrition Health Review Magazine is the consumer's medical journal that keeps the reader up to date on information about pursuing good health. Nutrition Health Review discusses disease prevention through nutrition and lifestyle and advocates health of both mind and body. 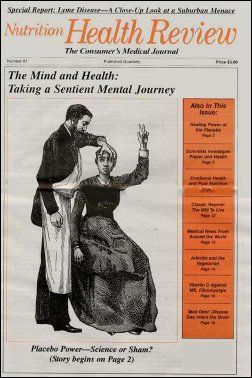 The editorial section of Nutrition Health Review covers medical progress and information relating to nutritional therapy, genetics, psychiatry, behavior therapy, surgery, pharmacology, animal health and vignettes relating to health and nutrition. Currently we can offer delivery to United States addresses only. Yes, this DOES include the territories and commonwealths ( American Samoa , Federated States of Micronesia , Guam , Marshall Islands , Northern Mariana Islands , Palau , Puerto Rico , Virgin Islands ).